antiunderscores wrote: im not saying this snare was great, but i dont think it coming from japan should be the reason behind it. if you had said "it's cheapily made" fair enough, but "made in japan" is not a synonym for "peice of crap"
Made in CHINA is a synonym for "peice of crap". I have been playing for 15 years and had several snares in my tenure. I just bought this snare a few weeks ago and I love it. As long as you use a non dampened head to keep the life in it and tune it up right, it sounds great. I am recording with it as we speak and I can post a sound clip of it in the next few days. My primary snare is a pearl piccolo 13x3 and this is my secondary snare that I find useful as a louder option that has a full body as well as an articulate crack that I have always loved ocdp drums for. and made in Japan? who cares? Starclassic's are made in Japan, so what's that tell ya? heres the latest of what were recording, I am rerecording the drumming, it was merely the scratch track for the rest of the band, but it still can give you an idea of the sound. the song is very roughly compressed and barely mixed, however during the end solo you can hear it working. this is using an mxl pen mic by the way, my sm57 is being borrowed by a freind, this is what I had for the scratch track. So did you get to hear it? No replies or posts in the few days i put it up. i just bought this snare..for 160. its great. i still have the stock skins on it..havent had time to tune it properly, but it sounds great still. A guy who works at G.c told me those things really fall apart easy..
well, mine is still gigging stron since november. i threw a Genera HD dry on it to get some ring control. 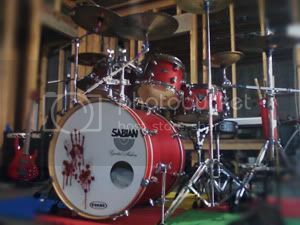 for a sound recorded, go to www.myspace.com/sobriquetrocks and listen to "Tell Me" thats that snare. disrupt13 wrote: A guy who works at G.c told me those things really fall apart easy..
that probly happend to one person and then everyone said it happend to them and it went from there. it happens with a lot of things. drummermike58 wrote: So did you get to hear it? No replies or posts in the few days i put it up. shine.fm-youth wrote: no, it's a crap drum mass produced probably made in japan or something with a ocdp badge on it..
youngdrummer1993 wrote: There's a reason it's called GUITAR center.